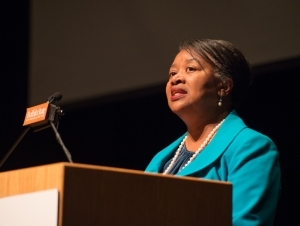 “Deepen your commitment to Buffalo State,” President Katherine Conway-Turner told faculty, administrators, and staff today at the 2016 President’s Fall Forum. Drawing on a Ghanaian image of the Sankofa, which Conway-Turner described as a bird looking backward to learn from the past while moving forward into the future, she began her third year as president of Buffalo State by looking at the accomplishments of the 2015–2016 academic year. In reviewing the accomplishments of the previous year, Conway-Turner praised past and present members of the college community who helped bring them about. She cited the 50th anniversary of both the Burchfield Penney Art Center at Buffalo State and the Great Lakes Center, the record number of students and faculty who took part in the college’s 18th annual Student Research and Creativity Celebration, more than 450,000 hours of student community service through the Volunteer and Service-Learning Center, and the reaccreditation of several programs. Looking forward, Conway-Turner challenged her audience to not only meet the goal of a 79 percent student retention rate in five years, but to exceed it by achieving an 80 percent retention. “Unless we stretch to meet ambitious goals, we are failing to fully challenge ourselves and to fully embrace the success of our students,” she said. Conway-Turner, who holds a Ph.D. in psychology, adapted Abraham Maslow’s hierarchy of needs to a college environment to describe the steps necessary to improve student persistence, retention, and graduation. Students’ basic college needs—nutritious food, good housing, and technological infrastructure—must be met first. Secondly, safety must be secured. Third, students must have a sense of belonging and of being cared about. From this basis, esteem follows, leading finally to graduation. For each step, Conway-Turner noted providers of student and campus services that help meet those needs, including food services, student housing, campus services, and the University Police Department. Students need to feel they are part of the Buffalo State family through student activities, and they also need strong academic advisement that provides clear roadmaps to graduation. “Faculty are central,” she told the audience. However, for students to succeed, all needs must be met concurrently. “I expect everyone from the cleaner in Porter Hall, to the University Police officer that patrols Butler Library, to each faculty member, to each person that supports student life, to our finance and record officers, to all embrace their role in student success,” she said. In closing, Conway-Turner invited all the audience members who were willing to join her to rise to show their willingness to work together to advance her goals. “You are all my partners in elevating student retention, persistence, and completion rates,” she said.